Surf Diner does not have any reviews posted yet. Be the first and post one below! Ocean dining at its best. Enjoy a hearty breakfast, a quick lunch or a relaxing dinner all while gazing at the surf. 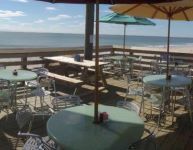 Located on the Surfside Beach Pier the Surf Diner offers traditional favorites including Calabash style seafood and local favorites including: hand pressed burgers, homemade crab cakes, fresh chicken salad, hand-shucked oysters and many other great items.